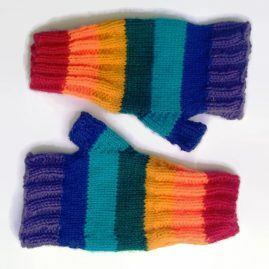 These soft warm fingerless gloves or mittens are knitted on circular needles in double Knit acrylic yarn, making them very soft, warm and comfortable to wear as the gloves have no seams. They also have an extra long 10cm cuff so that they are great wrist warmers. Can be made in any size or colours and with any picture or other personalised design making them suitable for men, women and children; simply give details of the size, colour(s) and picture or design that you would like in the Order Note To Seller box.They’d make a fabulous gift too! Fingerless gloves are so useful, allowing you to easily carry out activities outside and get into your purse and handle money and other small items with ease too. Rainbow accessories and clothing are also popular as a symbol of peace and diversity, and are particularly worn as hippy and pride accessories. Your mittens can be hand washed and dried flat. Postage is FREE within the UK, if you need them sent abroad, then please contact me for a cost price postage quote before ordering. Hi there. I make patchwork homewares, accessories and gifts made from recycled fabrics.I particularly like the scrappy look and am a great believer in recycling. 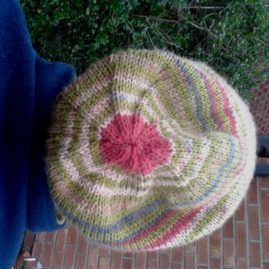 I also love knitting hats in unusual styles, and cable patterns. I suffer from Fibromyalgia and sew and knit as and when I’m able. If you are not totally in love with your item, I operate a 30 day money back guarantee (excluding custom or personalised items). Please email me within 14 days of receiving your item, indicating if you would like an exchange or refund. Please include date and details of your order: moragchristie66@gmail.com If you wish to return your item, you will be notified of where to send it. Unless the item is faulty, you're responsible for return postage costs. Once your return is received and inspected, you will receive an email to notify you that your item has been received. If requesting a refund, your Paypal account will be credited within 2 days. If you have chosen to receive an exchange, on receipt of the returned item, a replacement item will be made. In the unlikely event your item needs to be repaired, you’ll be informed how long this will take. Handknitted slouch hat made to order in any size or colours.